Built in 1926 by David L. Stern, The Eldon Luxury Suites Hotel, located at 933 L St. in Northwest Washington, DC is part of an on-going revitalization of the entire downtown neighborhood. The building is 10 stories high, and features a completely renovated interior as well as a historically restored exterior. This Washington DC luxury suite hotel opened in March 2009 as a unique luxury Condo Hotel, and is a part of the revitalized Shaw Historic District. It offers 50 guest suites at a 4 star standard. Located just 1/2 a block from the Washington Convention Center and the Mt. Vernon Square Metro Station, The Eldon Luxury Suites Hotel is at the center of D.C.'s new downtown. With one-two-and three bedroom suites and Penthouse ranging from 600 to 1500 square feet, The Eldon Luxury Suites Hotel defines stylish, exclusive living in the heart of our nation's capital. Our luxury suites include granite floors, custom Birchwood walls, side shower massage jets, and luxury fully equipped, full-size kitchens with granite counter tops. There are queen size sofa beds in all suites. All suites are fully furnished. Approximately 10 minutes cab ride to the White House, US Capitol, Library of Congress, the Smithsonian and more. To see local attractions, restaurants and entertainment click here. Off-site parking available. For the selective business traveler or tourist, The Eldon Luxury Suites Hotel offers the best alternative to impersonal hotels or drab corporate housing. It was beautifully remodeled to give each suite a warm, homelike feeling that is lacking at major hotel chains. 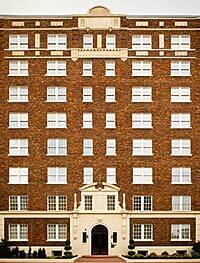 At the same time, it is just steps away from the grand avenues and landmarks of the Capitol and all it has to offer. This luxury suite hotel is perfectly geared for those who are looking for the best that hotels have to offer, with something beyond the impersonal hotel feeling. While at the epicenter of downtown Washington, DC, you still have an exceptional haven to rest and refresh in a harmonious setting. Corporate clients in town to complete a business project, visiting Diplomats and Government Officials, and Convention attendees can all benefit from the value and flexibility of short or long-term accommodations option, great city views, metro access, and more. Corporate housing or short-term rental does not have to feel dull. To the contrary, our clients who have flown across the country or halfway around the world will feel pampered and relaxed in the hours they have to themselves.